Pensacola State College is a public, comprehensive community college that was founded as Pensacola Junior College in 1948. As the oldest and largest college in the Panhandle, PSC serves traditional and non-traditional students in Northwest Florida and Southern Alabama. During its first year, 136 students enrolled at the college. Current enrollment is about 26,000 students. With six convenient locations, PSC has campuses in Milton, Pensacola and Warrington as well as centers in Century and South Santa Rosa County. The Downtown Center is headquarters for corporate training programs. Pensacola State College is widely recognized as a premier, student-friendly college that competes with the best – offering more than 100 programs, state-of-the-art resources, and a stellar faculty. Nationally ranked in the Top One Percent in affordable tuition, Pensacola State College is a smart move toward a bachelor’s degree or a high-tech career. Offerings include: Bachelor of Applied Science in Administration and Supervision, Bachelor of Science in Nursing, Associate in Arts, Associate in Science, and career oriented certificate programs. The B.A.S. and B.S.N. programs open doors for career advancement and retraining for those who have completed associate degrees. Students earning A.A. degrees have a guaranteed transfer to Florida’s 12 state universities. Students also transfer easily to prestigious colleges such as Cornell, Duke, Vanderbilt and Tulane. For students earning A.S. degrees and career oriented certificates, job placement is nearly 100 percent in many technical areas. The A.S. degree also transfers to Florida universities. Pensacola State also offers excellent opportunities via Dual Enrollment, Collegiate High School, Adult Basic Education, GED and Continuing Education programs. For more information, call (850)484-1547. Pensacola State College, serving Escambia and Santa Rosa counties and surrounding Alabama communities, was established as Florida’s first public State college by the state legislature in 1947. Classes were first offered in 1948 to 136 students; Pensacola State College now serves more than 22,000 students annually. 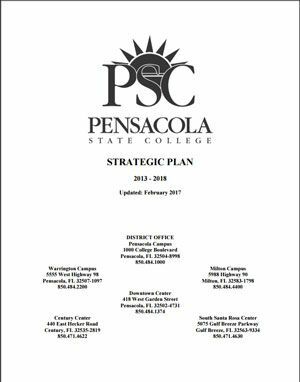 The development of the Pensacola State College Strategic Plan included the creation of a new vision statement, mission statement, and the establishment of a process for planning that includes overall institutional goals and objectives assigned to the appropriate functional units and administrative offices of the College. By participating in customer satisfaction surveys and an in-depth S.W.O.T. analysis, thousands of the College’s stakeholders, both on campus and in the community, played a direct role in the development of this plan. The Strategic Planning Committee was made up of a broad cross section of institutional representation, including student, instructional and business affairs personnel. Through a series of retreats, the District Board of Trustees and college administrators provided guidance and wise counsel. Pensacola State College, under the governance of a local Board of Trustees, is committed to providing quality, affordable, and accessible educational opportunities through a variety of delivery methods. The College, a member of the Florida College System, offers baccalaureate and associate degrees, workforce certificates, adult education leading to a high school diploma or GED, business and industry training, non-credit continuing education, community outreach, and cultural enrichment opportunities for students and the community. Enhance partnerships to further develop capabilities to better serve students and the community. d. Formally celebrating achievement, productivity, and continuous improvement. -maintaining a physical presence in strategic locations throughout the college service area. Seek new financial resources for the College and College Foundations. Ensure that existing resources are effectively utilized through improved efficiencies, entrepreneurial business practices, and established sound fiscal management. Acquire new resources to maintain and upgrade existing facilities, construct new facilities to better support learning and student and community services and enhance college programs and services. Seek increased diversity and promote a campus climate where the principles of affirmative action, equal opportunity, and multiculturalism are valued. Continuously improve customer service, campus safety, campus beautification, use of technology, institutional effectiveness processes, community service and internal communications. Market the College and programs of the College through current and emerging media conduits. Pensacola State College serves Escambia and Santa Rosa counties in Florida as well as surrounding Alabama communities. The population of the two-county area is nearly 450,000. The area is best known for its sugar-white beaches, historical significance, health care institutions, and military installations, one of which hosts the world famous Blue Angels flight demonstration team and the National Museum of Naval Aviation. Pensacola State College is proud of its highly qualified faculty. Typical preparation of the academic faculty member consists of graduate work beyond the master’s degree. Many faculty members hold doctorates. Faculty in vocational programs are trained specialists whose thorough knowledge of the occupation comes from both formal study and career experience. Though Pensacola State College students come primarily from the local community, faculty are drawn from various colleges and universities across the nation to broaden the scope of instruction. Pensacola State College faculty members hold positions on boards and commissions and belong to professional and scholarly organizations. Many are engaged in research and have authored articles, monographs, and textbooks. In 1986, Pensacola State College established the Academy of Teaching Excellence to recognize outstanding faculty. Each year, four full-time faculty and one adjunct faculty are inducted into the Academy, and one outstanding new faculty member is honored. Pensacola State College faculty also benefit from a number of endowed teaching chairs that are supported by private contributions to provide travel and research opportunities. The Pensacola State College Foundation, Inc., is a private, non-profit corporation that has been established to encourage, solicit, receive, and administer gifts and bequests of property and funds for the benefit of the College and College activities. The Pensacola State College Foundation is administered by a Board of Governors made up of members of the community who have an interest in the College. The Pensacola State College Foundation promotes the annual giving program of the College and solicits funds for various college projects. In addition, donations are sought for scholarships and other worthwhile projects, which assist the College and its students. As a tax-assisted institution, Pensacola State College cannot meet all needs with state and student support. The Pensacola State College Foundation assists in obtaining private support to supplement College budgets. The Pensacola State College Foundation is a 501(c)3 tax deductible non-profit corporation and a direct support organization chartered by the state of Florida to provide private support to the College. The Board of Governors of the Pensacola State College Foundation meets quarterly and holds an annual meeting to elect new governors. Lynsey Listau, Michael Listau, Layla Zandi and Kasey Jones were named to InWeekly’s 2018 Rising Stars listing. Pensacola State College’s Century Mobile Welding Program was recognized as one of the Top Ten Finalists for a 2018 National Bellwether Award. The National Bellwether Awards annually recognize outstanding and innovative programs and practices that are successfully leading community colleges into the future. In February 2018, Pensacola State College’s Veterinary Technology program received full accreditation from the American Veterinary Medical Association’s Committee on Veterinary Technical Education and Activities. Pensacola State’s Collegiate High Future Business Leaders of America chapter was named the Outstanding FBLA Chapter of the Year during the 2018 District 1 Conference Awards Ceremony. Two members placed first in competition and advanced to the state conference. Two other chapter members placed second and will serve as voting delegates at the conference. Pensacola State College was named a 2018 Military Friendly® School by Victory Media. This is the ninth consecutive year, PSC has received the designation awarded to U.S. colleges, universities and trade schools that dedicate resources to military students to ensure success in the classroom and after graduation. A standing-room only crowd turned out for the ribbon cutting and grand opening celebration of Pensacola State College’s Charles W. Lamar Studio on Feb. 20. Located adjacent to the Anna Lamar Switzer Center for Visual Arts, the 11,000-square-foot studio was made possible by a $1 million gift from the Lamar, Reilly and Switzer families in 2014. The donation served as seed money for the construction of the $3 million facility which was completed in 2017. Pensacola State College has received $1.86 million for workforce training programs from an $85 million Florida Job Growth Grant Fund. The college was among nine entities awarded $35 million of the total funding, Gov. Rick Scott announced on Tuesday, Feb. 6, in Jacksonville. Beginning March 1 with the Safety Month Kickoff and Law Enforcement Panel, daily events followed including workshops, discussions and demonstrations designed to foster safety awareness. A “Safety Day” was held at each campus and representatives from local police and fire departments, the Red Cross, Escambia Emergency Management, the Arrive Alive Tour Drunk & Distracted Driving Simulator, and Lakeview Center’s SHAPE (Substance-abuse, HIV Assessment & Prevention Education) bus offered a variety of learning opportunities for students, faculty and staff. Free food, t-shirts, and other giveaways were a big hit as well. A variety of safety-related topics were covered including cyber security, identity theft and interacting with law enforcement. First aid seminars provided AED and CPR training and personal protection training sessions offered instruction in Krav Maga (“Contact Combat,”) self-defense for women and active shooter training. Safety Month wrapped up on March 22 with a Personal Safety Panel that featured experts on mental health, domestic violence, human trafficking and social media threats. Following a brief presentation on each topic, audience members participated in an engaging question and answer session with the four panelists. A picture may be worth a thousand words but a video turned out to be a home run for the Pensacola State Pirates baseball team. The Pirates beat out baseball organizations from Arizona to Georgia to win a field tarp from the Pensacola Blue Wahoos. The Blue Wahoos received a new tarp for its seventh season, and held a video contest to find a home for the old one which was still in good condition. The 30-second video had to be posted to the baseball team’s Facebook page with the Blue Wahoos being tagged in the post. The contest ran from late February until March 2. Pensacola State’s “fishing on the field” video won the contest and featured Pirates ─ Chad Bryant, Jared Hatch, A.J. Yates, Aaron Ginn, J.R. Breeden and Josh Rulli “fishing” on a very wet field on a rainy game day. Gov. Rick Scott signed HB 75/Military Assistance Bill on April 6, which authorizes Pensacola State College to waive fees for active duty military students using tuition assistance. The bill unanimously passed the Senate and House on March 13. Beginning July 1, Florida College System institutions, which includes Pensacola State College, will be able to use the U. S. Department of Defense Military Tuition Assistance (MTA) program to waive any portion of fees for student activities and services, financial aid, technology, and capital improvements. The Military Tuition Program covers tuition expenses for service members at postsecondary education institutions. There are currently 328 active duty military students enrolled in Pensacola State College who use MTA to pay for their education. In April 2018, six Pensacola State College visual arts students earned three gold and five silver awards at the 57th Annual 4th District American Advertising Awards Gala in Orlando. Kelly Bestgen won two gold awards while Alicia Kanuck won one gold award. The two automatically advanced to the 2018 national competition. Pensacola State College hosted the 2018 SkillsUSA Florida State Leadership and Skills Conference April 30 and May 1. The conference, along with the Worlds of Possibilities Career Expo, was held at the Pensacola Bay Center. The event attracted about 6,000 visitors and had a $3.8 million impact on the local economy. Thousands of Escambia County and Santa Rosa County students visited the Worlds of Possibilities Career Expo on April 30 and May 1. The expo included 12 hands-on interactive worlds, where more than 60 business and industry partners set up exhibitions. At least 300 job seekers also turned out for the Worlds of Possibilities Job Fair held April 30 on the Bay Center’s third floor. The College also will host the 2019 and 2020 state conferences. Coleman’s winning composition, “Room 857,” is written for solo piano. A Pensacola State adjunct music instructor for more than 24 years, he will perform the piece in August at Ehrbar Hall in Vienna, and at Bӧsendorfer Hall at Mozarthaus during the Golden Key Music Festival at Vienna. Longtime PSC visual arts professor William “Bill” Clover passed away on May 7, 2018. Well-known for his ceramic pottery, the Los Angeles native arrived at Pensacola State in 1966 – to work only a few years – or so he thought. Instead, Bill spent more than 52 years, becoming the College’s longest-serving faculty member. He worked under five Pensacola State presidents: T. Felton Harrison, Horace “Ed” Hartsell, Charles A. Atwell, G. Thomas Delaino and currently, Ed Meadows. And over his career, he educated and influenced more than 10,000 students including parents, grandparents, grandchildren and great-grandchildren. A generous spirit, Bill volunteered at Manna Food Pantries for over a decade – helping the charity raise nearly $300,000 during Pick a Bow, Fill a Bowl fundraisers. In 2014, he received the U.S. President’s Volunteer Service Award for contributing more than 7,000 hours of service to Manna. He also was recognized for his work in creating more than 6,500 handcrafted bowls for the fundraisers. Bill is survived by his wife, Kathleen; daughters, Kristen and Christi; and one granddaughter, Katie. PSC culinary arts Instructor Jimmie Langham received the 2018 Florida SkillsUSA Advisor of The Year award. Also, the College’s SkillsUSA chapter was named a 2018 Gold Medal Chapter of Distinction. Fifteen Pensacola State College SkillsUSA student-members qualified for the organization’s national conference ─ after winning gold at the state level. Pensacola State also was named a 2018 Gold Medal Chapter of Distinction, and PSC Culinary arts Instructor Jimmie Langham received the Florida SkillsUSA Advisor of The Year award. Pensacola State students won gold medals in nine categories, silver medals in three and bronze medals in two. Gold medal winners advanced to the 54th annual National Leadership and Skills Conference. Kelly Bestgen won two gold awards while Alicia Kanuck won one gold award. The two advanced to the 2018 national competition held June 8 in Chicago. This year is Hamilton’s 35th year in college athletics. Twenty-nine of those years have been at Pensacola State where Hamilton was head baseball coach before retiring in 2010. He has been the college’s athletic director since 1999. Two Pensacola State College SkillsUSA student-members are among the best of the best after placing first at the organization’s national conference. Five other Pensacola State student-members placed third and fourth in their competitions during the 54th annual National Leadership and Skills Conference held June 25-29 in Louisville, Kentucky. Katherine Schweitzer won first place in the Customer Service Category. Sonja McCall-Strehlow was her advisor. Billie Morris captured first in the Medical Assisting Category. Mary Turner was her advisor. Team A members ─ Anna Fischer, Kristine Kaibigan and Mathew Parker ─ placed third in the Occupational Health and Safety competition. Arvie Vitente was the team’s advisor. Elizabeth Carver won fourth place in the Photography competition. Mark Francis was her advisor. Tamilea North placed fourth in the Nursing Assistant category, Mary Turner is her advisor. Twelve members of the Pensacola State College Outdoor Club experienced the adventure of a lifetime June 4 -9 during a leadership and skill-building primitive camping trip to Standing Indian Mountain, just north of Franklin, North Carolina in the Nantahala National Forest. 77.4% of Pensacola State College Veterinary Technology students who graduated during the period from July 1, 2015 through June 30, 2018 earned a passing score on the Veterinary Technical National Exam (VTNE). Two Pensacola State College veterinary science students were placed at the 2018 HOSA National Leadership Conference held June 27-30 in Dallas. Katherine Gaskill won third place while Christina Zaccardi placed fourth in the Postsecondary/Collegiate Event for Veterinary Science. Pensacola State recognized six of its own during the College’s 2018 Employees of the Year ceremony held July 19. A delegation of Pensacola State College students and faculty spent several weeks touring and learning about Costa Rica – in the Central American country. Six Robinson Honors Program Scholars along with 14 other Pensacola State students and three faculty members were part the July 3-12 service-learning trip. During the 10-day Robinson Honors Program Service Learning Trip, the group learned about sustainable farming practices, assisted with sea turtle conservation efforts, participated in the Cahuita e-bird project, met and dined with the Bri Tribe and so much more, said Amber Carey, Robinson Honors Program coordinator. “This was our first trip since the re-establishment of the Robinson Honors Program and we wanted to do something very unique with hands-on learning,” Carey said. Pensacola State College ranked among most affordable colleges in U.S.
A delegation of Pensacola State College students and faculty spent a couple of weeks touring and learning about Costa Rica – in the Central America country. During the trip, the group learned about sustainable farming practices, assist with sea turtle conservation efforts, participate in the Cahuita E-Bird Project, socialize and dine with the Bri Bri indigenous tribe and so much more, said Amber Carey, Pensacola State’s Robinson Honors Program coordinator. More than 400 pieces were donated to Pensacola State with the stipulation the artwork be used to help visual arts students further their education. Much of the collection is artwork created by Duke; however the bequest also includes pieces him and his late wife, Jo Lynn, acquired during their travels and other pieces given to the couple. Some pieces from the collection was up for bid during the Bill Clover Memorial Auction held on Oct. 25, in the Anna Lamar Switzer Center for Visual Arts. Proceeds from the auction will be used to establish the Bill Clover Endowed Scholarship. Pensacola State College received nearly $40,000 in August to help students pay for the cost of higher education. Florida College System Chancellor Madeline Pumariega and FCS President Judy Green presented a ceremonial $27,220 check to Pensacola State President Ed Meadows. Manna Food Pantries has renamed its annual Pick A Bowl, Fill A Bowl fundraisers the Bill Clover Pick A Bowl, Fill A Bowl ** to honor the late Pensacola State professor Bill Clover. For more than a decade, Clover helped the charity raise nearly $300,000 during the fundraisers. In 2014, he received the U.S. President’s Volunteer Service Award for contributing more than 7,000 hours of service to Manna. He also was recognized for his work in creating more than 6,500 handcrafted bowls for the fundraisers. Pensacola State College Institutional Research analyst Eugenio Hernandez and Director of Institutional Research Michael Johnston recently received recognition from the National Student Clearinghouse (NSC) for publishing their step-by-step guide, “It’s Element-ary: Perfecting StudentTracker Data Elements,” on the Association of Institutional Research website. Pensacola State College cybersecurity students attended the Bank of America/Merrill Lynch cybersecurity conference on Thursday in the Jean and Paul Amos Performance Studio on the Pensacola Campus. Pensacola State College Hosted the SkillsUSA Florida Region 1 Fall Leadership Conference on Thursday, September 20. Congratulations to the newly elected officers for the 2018-2019 school year! Pensacola State College celebrated its 70th birthday with week of activities Sept. 10-14 at all of the campuses. Sept. 13, 1948, is the official opening date of the College which began in the Aiken Boarding House on the corner of Palafox and Cervantes Streets with 128 students. Today, the College has grown to three campuses: Pensacola, Milton and Warrington and three centers: Century, Downtown and South Santa Rosa. More than 100,000 graduates have earned associate, bachelor’s degrees as well as workforce certifications from the College. NASA astronaut Alan Poindexter, NASA engineer William Lawrence Peters, Sacred Heart Foundation President Carol Carlan and U.S. Army vocalist Antonio Giuliano are among the many outstanding Pensacola State graduates. Pensacola State College student Jennifer Ojeda was selected the Florida College System Chancellor’s Clark Maxwell Scholar of the Month for September. The award recognizes outstanding FCS students who demonstrate leadership skills, academic success and/or commitment to community service. Students are recognized monthly by the Florida College System Chancellor with a $150 scholarship, certificate and highlighted in the newsletter. Twenty-three years after graduating high school, Ojeda returned to further her postsecondary education at Pensacola State. She is pursuing a Bachelor of Applied Science in Business and Management degree. A Robinson Honors Program Scholar, Ojeda was recently inducted into Sigma Beta Delta, the National Honor Society recognizing academic achievement in business, management and administration. Members of the PSC Cyber Defense Team are Justin Eldridge, Tyler Group, Patrick Owens, Marie Perry, Daniel Pieknik and Daniel Pitsenbarger. Adjunct professor Karin Carter is the team advisor. Pensacola State employees and students, along with the Pirates Baseball team, were at the Ronald McDonald House to remove the old beds and install 48 donated beds in 26 guest rooms that provide a home away from home for families who travel to Pensacola to receive critical medical care for their children. A second group from Pensacola State volunteered at First City Art Center to assist with setting up their Pumpkin Patch Party by helping landscape the facility and setting up tables with over 1000 blown glass pumpkins for their largest fundraiser of the year. Pensacola State College has become part of “Pathway USA,” a collaborative program between the University of South Alabama and select community and state colleges that creates a seamless transition to USA for transfer students who earn their associate’s degree. Pensacola State is the first Florida College System institution to join the program. The academic partnership will enable more PSC graduates to transfer to USA and earn their bachelor’s degrees from the university. Ground was broken Nov. 13 for the East Wing of Pensacola State College’s new STEM building. Construction on the first phase (East Wing) of the facility will begin in January – following the abatement and demolition of the existing Mary Ellison Baars Building. The East Wing will be home to the College’s cybersecurity and mathematics programs. The cost for the East Wing is $13 million. The total cost for the entire facility is projected to be $34 million. A construction start date has not been set for the second phase (West Wing and second-floor connector). Region 1 HOSA – Future Health Professionals held their Fall Conference in the Jean and Paul Amos Performance Studio on October 17th. Newly elected officers for the 2018-2019 school year are: Secondary Historian Amaya Colston, Secondary Reporter Bailee Weaver, Secondary Parliamentarian Katie Patterson, Secondary Treasurer Jassamyn Wood, Post-Secondary Secretary Christopher Stafford, Secondary Vice President Jackson Kiewiet, and Secondary President Destyni Weiss. Pensacola State College baseball team faced Coastal Alabama Community College during the inaugural Century Classic held Oct. 20 at Showalter Park in Century. Former PSC and Major League Baseball players, Bill Sadler and Greg Litton, along with Escambia County District 5 Commissioner Steven Barry were special guests at the Classic. Pensacola State College’s Century Center has started a community garden for the residents of Century and surrounding areas. Pensacola State College was among four Florida College System institutions recently recognized for innovation and excellence by Chancellor Madeline Pumariega. Pensacola State received a Chancellor’s Best Practice Awards for the Bellwether Virtual Tutoring Program which serves more than a 1,000 students each year. The program provides services to students who might not have access to traditional tutoring methods by offering access to individualized services from any location or device with an internet connection. Florida Gateway College, North Florida Community College and Polk State College also received 2018 Chancellor’s Best Practice Awards from Pumariega. The four state colleges were honored at the AFC 69th Annual Meeting and Conference in Orlando. Pensacola State’s Public Safety Department and Office of Institutional Diversity and Student Conduct will work collaboratively with Favor House of Northwest Florida, Legal Services of North Florida, and Lakeview Center Inc. to make all campuses and centers safer. Yeikson Montero, a guard for the PSC Pirates, was named an NJCAA Region 8 Men’s Basketball Player of the Week for Nov. **-**. The 6-foot 5-inch Dominican Republic native is a sophomore. Three Pensacola State College student-athletes – Chad Bryant, D.J. Wilkinson and Ryan Brewer – will continue their athletic careers at the University of Alabama, Troy University and the University of West Florida, respectively. Bryant, a right-handed pitcher, will join the Crimson Tide for the 2019-2020 season. A Thomasville, Alabama, native, Bryant was selected in the 36th round of the 2018 MLB draft. Wilkinson, a right-handed pitcher, will play for the Trojans in 2019-2020. A Monticello, Florida, native, Wilkinson leads the Pirates in several pitching categories – wins (8), innings pitched (67.1) and strikeouts (73) during the 2017-2018 baseball season. Brewer, an infielder and pitcher, will play for the Argonauts in 2019-2020. An Ocoee, Florida, native, Brewer threw significant innings on the mound while batting .286 with two homeruns and 14 RBIs during the 2017-2018 Pirates baseball season. In November 2018, ground was broken for Pensacola State College’s East Wing of the new STEM building. Construction on the first phase (East Wing) of the facility started in January 2019 – following the abatement and demolition of the existing Mary Ellison Baars Building. The East Wing will be home to the College’s cybersecurity and mathematics programs. The cost for the East Wing is $13 million. The total cost for the entire facility is projected to be $34 million. A construction start date has not been set for the second phase (West Wing and second-floor connector). In November 2018, Pensacola State College was among four Florida College System institutions recognized for innovation and excellence by FCS Chancellor Madeline Pumariega. Polk State College received 2018 Chancellor’s Best Practice Awards from Pumariega. The four colleges were honored for programs of excellence at the Association of Florida Colleges’ 69th Annual Meeting and Conference in Orlando. Pensacola State was honored for the Bellwether Virtual Tutoring Program which has helped thousands of students. The program provides services to students who might not have access to traditional tutoring methods by offering access to individualized services from any location or device with an internet connection. Pensacola State College web administrator, Frank Asprer, developed the “PotluckPigeon” app which creates separate lists to keep track of party planning. It’s now available in the Apple iTunes store. Bob Thomas of the Cantonment Rotary Club awarded Phi Hoang Pham and Tiara Ruggs with the scholarships during a luncheon held Nov. 14 in the Molly McGuire Culinary Dining Room on the Pensacola campus. In November 2018, Pensacola State College was awarded a $300,000 grant from the U.S. Department of Justice’s Office on Violence Against Women (OVW). This award will make possible a range of services, including specialized training for campus law enforcement, service providers, and campus personnel as well as training and programming for Pensacola State College students at all campus locations. In December 2018, the Gulf Power Foundation pledged $150,000 to Pensacola State College to help establish training for nonprofit organizations’ professional staffs and boards. The first $30,000 donation will be used to develop Certified Fund Raising Executive courses on funding diversification, board development, grant writing, comprehensive campaigns, and donor-centered proposals and presentations. Over the next five years, scholarships also will be provided for worthy students and qualifying nonprofit organizations. Pensacola State College employees donated food, cleaning supplies and personal care items to Gulf Coast State College employees and students to help with their Hurricane Michael recovery efforts. Items were collected on the Pensacola, Milton and Warrington campuses and Century and South Santa Rosa centers for several weeks. Jonathan Garrett, PSC’s environment management manager, delivered a van filled with the donated items to Panama City on Friday, Dec. 7. Pictured are PSC Administrative Assistant Betty Freeney showing off the vanload of emergency supplies and Gulf Coast State employees unloading the items that will be used to restock the College’s pantry. President Meadows called Gulf Coast State President John Holdnak early Friday morning to let him know the donations were on the way. In December 2018, Pensacola State President Ed Meadows was tapped to join Gov.-elect Ron DeSantis and Lt. Gov.-elect Jeanette Nuñez transition education and workforce advisory committee. Meadows joined more than 40 others on the Transition Advisory Committee on Education and Workforce Development. The committee is comprised of a diverse group of education experts, including traditional K-12 public school system leaders, education advocates, elected school board members, academics and current and former leaders of Florida’s higher education system. Pensacola State College has athletes who come from all over the world. However, the College’s president along with an administrator and a professor now own tie pins that come from the land Down Under. “I uploaded the official branded artwork from the Pensacola State College website and sent it to the company, and then I just waited,” said Ward, who has worked at the College for three years. The photography of Pensacola State’s own, Kristen Regan-Miller, will be on exhibit in New Orleans through February. Luna Fine Art Gallery will present the curated solo show, “Kristen Regan: Plastisphere,” by Regan, an associate Pensacola State professor. The photo collection explores the sublime beauty of this microscopic world with the intention of raising awareness of the dangers plastic represents for the marine world. The exhibit will be on display Dec. 8, through March 17at the art gallery located at Luna Fine Art Gallery in The Mercantile Hotel is at 727 S Peters St. in New Orleans. PhotoNOLA is an annual celebration of photography in New Orleans showcasing work by photographers. The festival includes exhibitions, workshops, lectures, and more. Pensacola State College will celebrate the Pirates’ rich athletic history with a ribbon cutting and induction ceremony for the 10-member inaugural class of the Pensacola State College Athletics Hall of Fame on Feb. 16. Employment: Writer for Backpacker magazine; outpatient physical therapist assistant at Pensacola Spinal Rehabilitation Center; and adjunct instructor at Pensacola State. Stopp’s writing also has appeared in various newspapers, magazines, anthologies and on several websites. Published in November 2017 by McFarland & Company, “Hurting Like Hell, Living with Gusto” shares Victoria Stopp’s battle with chronic pain. Reflecting on experiences as a patient and healthcare professional, Stopp describes her transition from a healthy active lifestyle to years of learning to live with debilitating pain. The main catalyst behind “Hurting Like Hell, Living with Gusto,” Stopp said was an interview with Runner’s World magazine. Stopp said she received the contract for “Hurting Like Hell, Living with Gusto” while teaching in Pensacola State’s physical therapist assistant program on the Warrington campus. “I’d had an essay published in an unrelated book about baseball, and the editor asked if I was working on any books of my own. I said yes, submitted a 22-page proposal, and within a few weeks, my book was under contract,” said Stopp, who has also appeared on WSRE’s “Conversations with Jeff Weeks,” Fox 5 Atlanta, WUWF and multiple podcasts.